Used by prescribers around the world, the Tarascon Pharmacopoeia® 2019 Deluxe Lab-Coat Edition continues its tradition as the leading portable drug reference packed with vital drug information to help clinicians make better decisions at the point of care. 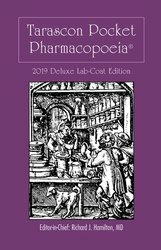 The Tarascon Pharmacopoeia® 2019 Deluxe Lab-Coat Edition is an expanded version of the Classic Shirt-Pocket Edition, containing more drugs, black box warnings, evidence-based off-label indications for adults and pediatric patients, and additional tables. This reference also includes typical drug dosing (all FDA approved), available trade and generic formulations, metabolism, safety in pregnancy and lactation, relative drug pricing information, Canadian trade names, and an herbal & alternative therapies section. Multiple tables supplement the drug content, including opioid equivalency, emergency drug infusions, pediatric drug dosing, and much more. The Tarascon Pharmacopoeia® 2019 Deluxe Lab-Coat Edition is an essential resource for all physicians, pharmacists, nurses, physician assistants, dentists, medical transcriptionists, and other point of care providers. Each edition is meticulously peer-reviewed by experts and is now available in multiple print, mobile, and digital formats. The Tarascon Pharmacopoeia is also available in a Classic Shirt-Pocket version.